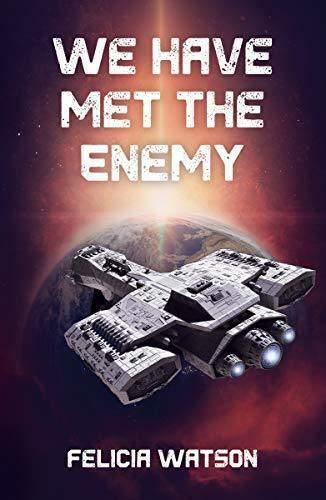 We Have Met the Enemy was written by Felicia Watson and published on Kindle by D. X. Varos, Ltd on April 2nd, 2019. If you are reading this prior to April 2nd you have time to go pre-order it and have it the day it releases. Based on goodreads author page Felicia Watson has authored 2 other books prior to this one. The protagonist in the book is Naiche Decker. Decker is haunted by her mother’s death at the hand of the Eternals, which are the Antagonists of the story. After Naiche’s mother was killed she was raised by her Grandfather. Naiche’s father was never involved in her childhood. The story starts off in the year 3028 with Decker leaving home to join the Uniterrae Defense Corp (UDC). The Uniterrae is the government of most of the human race. Apparently, there are some holdout communities such as the Chiricahua, of which Naiche Decker is part of. Decker joins the UDC to avenge her mother’s death at the hands of the Eternals. The main plot device is a strategy the UDC has developed to try and bring an end to war with the Eternals. Decker volunteers to participate in the mission solely to support her friend and commanding office. She also hoped it would give her a chance to kill more Eternals. There are a number of sub-stories within this book. Decker has baggage due to her mother’s death, her absentee father, and her isolated upbringing. This baggage is a constant source of friction throughout the story. I found this book while browsing Amazon and other sites for Sci-Fi books coming out in 2019. I also have been looking for authors I have never read. I am reading so many series that I could just read the new books coming out and never explore or learn about new books and authors. After finding We Have Met the Enemy, I reached out to the Author Felicia Watson about an advanced copy to review. Shortly after her publishers contacted me and sent me a copy of the book to review. If a book is already released I would have just bought it like I have every other book I have reviewed. Since this book is pre-released I accepted a free review copy. I found the story entertaining. There are two major storylines happening at the same time. The first story is a story about a young woman, Naiche Decker facing her demons, learning and growing as a person. Decker’s story is a little off-putting at first because she is extremely antisocial, vengeful, and a little bias against anyone, not Chiricahuan. The second story is about a plan to find the Eternals home planet in order to find some mechanism to stop to end the war. The plan consists of sending ships out in the direction of old colony ships believed to have led the Eternals back to Earth. We Have Met the Enemy could have stood alone with just the storyline of trying to end the war. It was very interesting as the crew of the Lovelace traced the ancient path of a colony ship which disappeared. The Lovelace encountered aliens, other humans, ancient technology, and of course, the Eternals. Once the Lovelace left for on their mission, this book became a space opera. Character development in We Have Met the Enemy is very well executed. The Naiche Decker character development was a central tenant of the book. I especially love that she has a dog which goes with her everywhere. Some parts of Decker’s backstory could have been left out but overall it was good. Once Decker arrived on the Lovelace her development was superb. Felicia Watson pivoted character development from backstory to character conversation once the crew of the Lovelace was being assembled. I prefer to “overhear” characters backstory from other characters telling the story. In real life, it may feel like gossip however in a book it’s a powerful way to convey a backstory without flashbacks and long chapters of backstory. A core component of any good Space Opera is the captain. Matt Ricci commands the Lovelace and has a reputation of being a good captain with a great future in the UDC. Ricci’s character development throughout the book is excellent. The story gives hints about Ricci’s personality little by little. Since he is the Captain he must guard his feels and appear confident at all times. There is a nice twist with Ricci I enjoyed. The book is full of great character development. Two more noteworthy characters are Nils Lindstrom and Conroy Kennedy. Lindstrom is the first office and as such, in charge of dealing with Decker. Kennedy is Decker’s friend and commanding officer. I especially liked Lindstrom’s efforts with Decker and Kennedy’s unwavering support. It gave the book a good balance and Decker a much-needed support system. Particularly fun were the love lives of both Kennedy and Lindstrom. The pace was good through out the book. I never look at how many pages a book is, but I do try to gauge my feeling about it at the 50% mark. At 50% mark a book should have you filly engaged. We Have Met the Enemy delivers in this regard. The prologue and chapter one were the weak links in the pace. In general, I think prologues should be removed from books. Prologues are meant to convey to the reader the information contained is a necessary component to understand the story, an introduction. Typically prologues are a slog and this one is no different. Chapter one was also a missed opportunity to set the pace of the book and show the audience some of the things Decker has been going through. The first part of chapter one has Decker going on a search and rescue mission which hints at some of the horror of the Eternals. She gets into an argument about having to kill a “friend” infected with the Eprion. The book should have opened with Decker in a fight where she had to kill a friend and show the reader the emotional toll. The arguments about if she was right or wrong to perform the “service” for her friends could have happened on the ship with people not as close to the fighting on the ground. The pace of the book is set about midway through chapter two. I don’t recommend skipping the prologue and chapter one but just keep in mind the book is excellent and just takes a chapter or two to get going. It’s challenging to the be completely original in Science Fiction. There are components in this book which are common across the genre. The interesting pieces are how the difference components were stitched together in a single book. This book has energy based life forms, colony ships gone lost, human colonies that have lost contact with earth, and aliens of all different types. How each of these common plot devices was used was very original and entertaining. I loved the way the bird people dealt with the Eternals. I also liked the space battle with the Rock people. All very good brief story arcs. My only real complaint about originality is the cover art. The ship on the cover is way too close to the BC-304 Deadalous from Stargate. 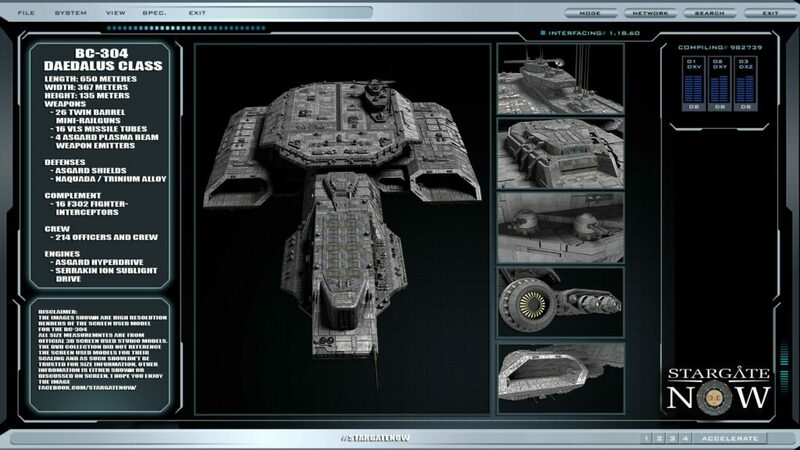 This ship is Immediately recognizable to Science Fiction fans. It’s not an exact copy and paste, but still too close for comfort. See image below. The technology in We Have Met the Enemy supported the story. The book is not “Hard Sci-Fi” where we get into the minutia of the technical nature of the wonders. The book takes place about one thousand years in the future and approaches technology as something common. There is faster than light travel, space drones, advanced medical technology, and other interesting technology but it is not a central tenant of the story. The technology level seemed more practical than fantastical. There are no transporters or wormholes, more like super fast trains and spaceships with gravity. I enjoyed We Have Met the Enemy. If you liked Jazz, the protagonist in Artemis by Andy Weir then you will like Naiche Decker. I enjoyed her evolution throughout the book. I started out unsure if I liked her and ended up loving her. This book was very much a Space Opera and I loved that part about it. I think this book could have been edited down a bit and have a more powerful opening but overall I thought it was great. Some readers may take offense at Deckers questionable out bursts. In almost every heated argument she makes a derogatory remark. I didn’t mind it because it seemed more real, but to some readers it could be over the line. It was particularly interesting to see her grow out of that a bit as she learns the truth about her past. I hope you enjoyed the review. I recommend reading this book and leaving a comment here when you are finished. Let me know if you agree with my review or have a different take on the story.